Everything is SU except for the buttons. 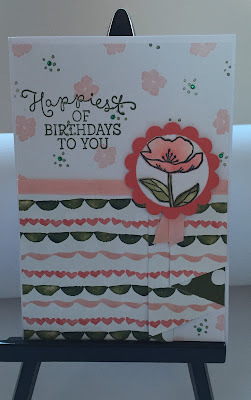 I sponged the stripes using night of navy and that was about the most time consuming thing Lol! 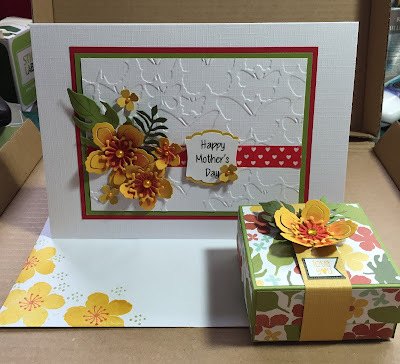 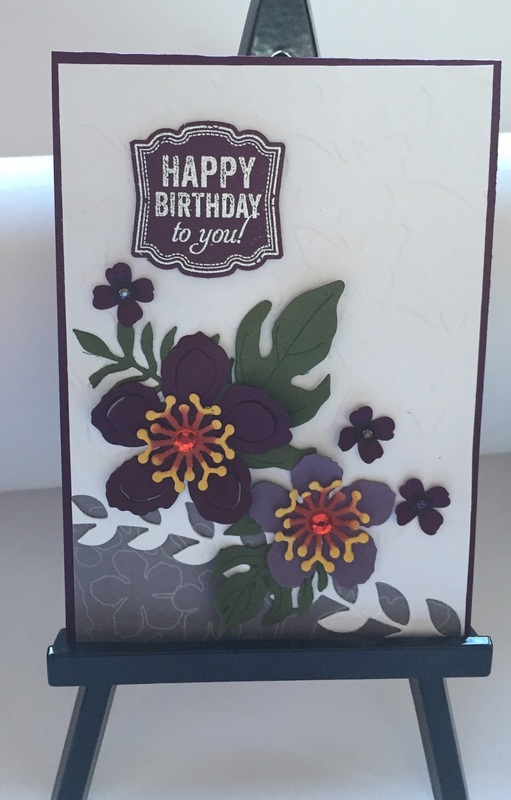 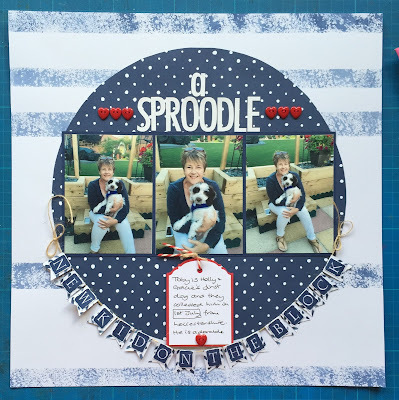 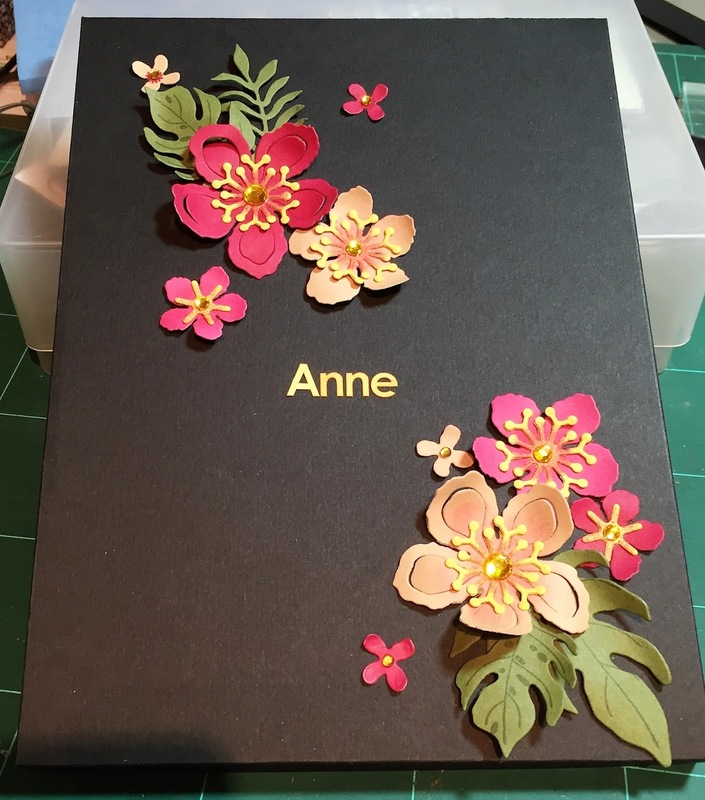 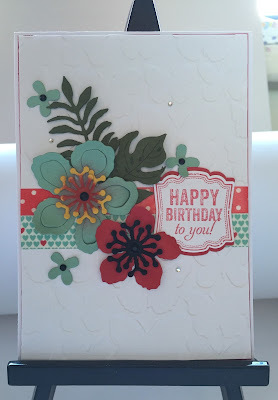 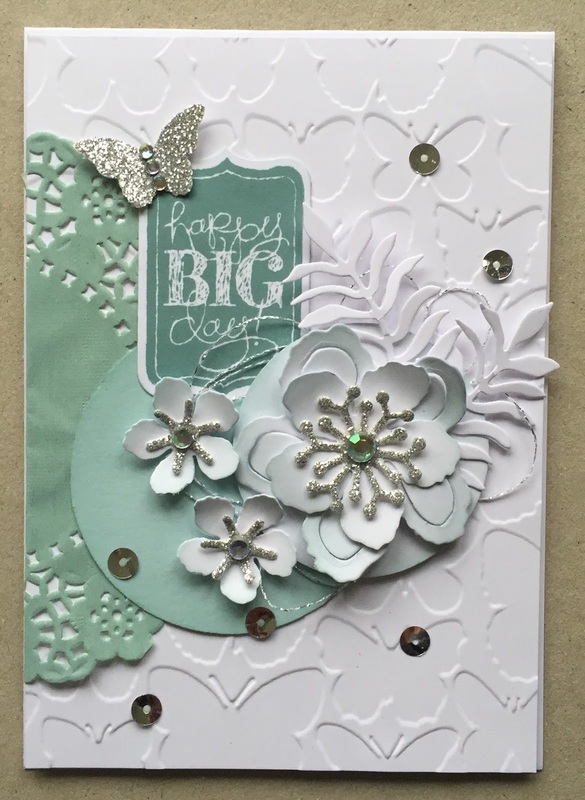 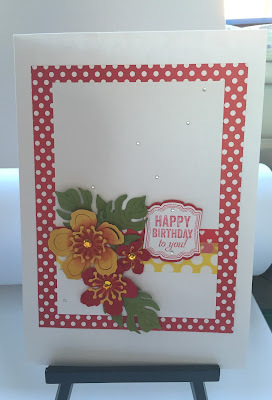 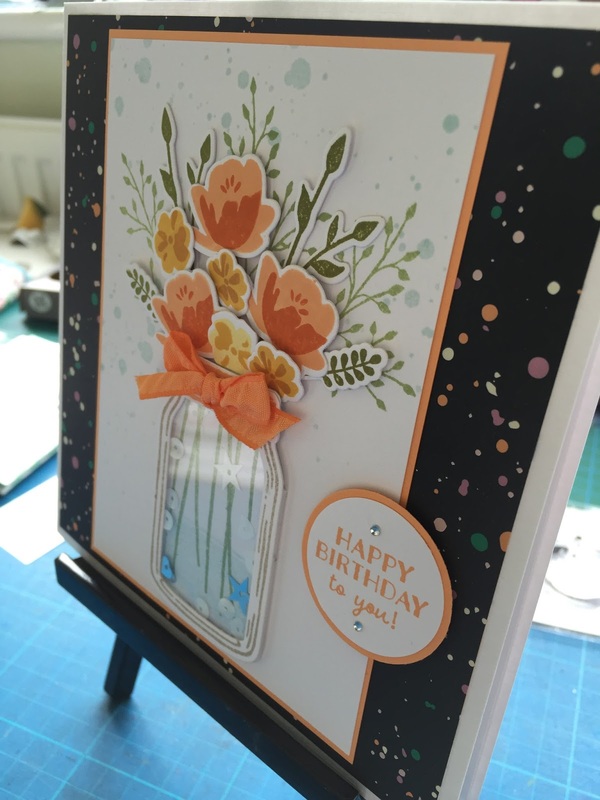 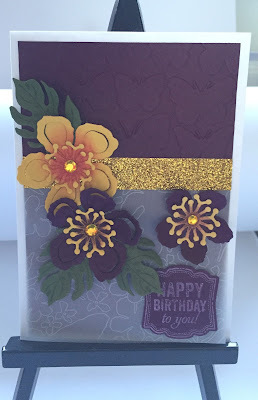 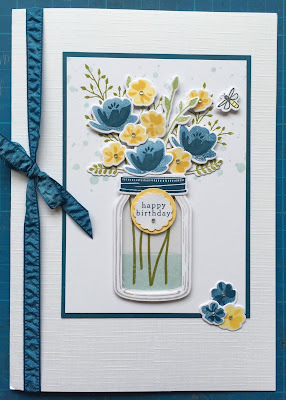 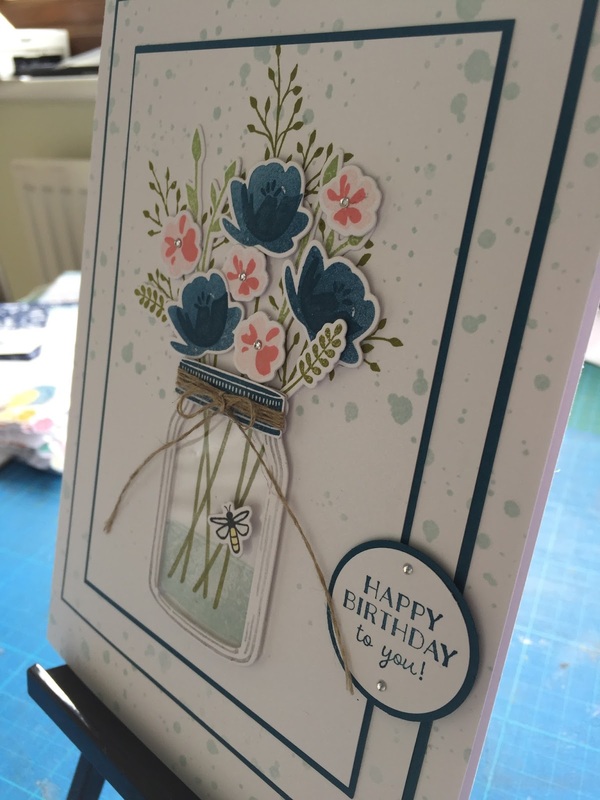 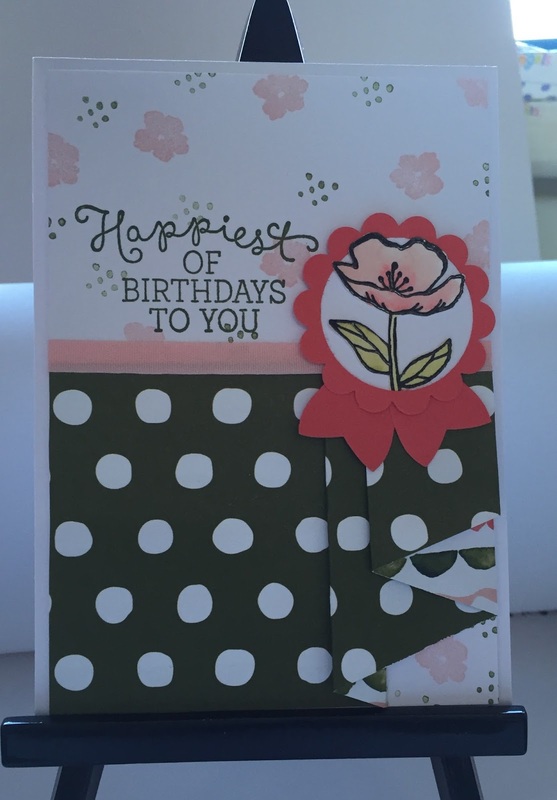 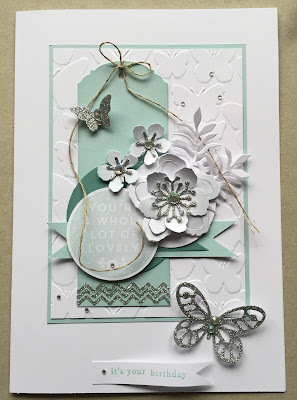 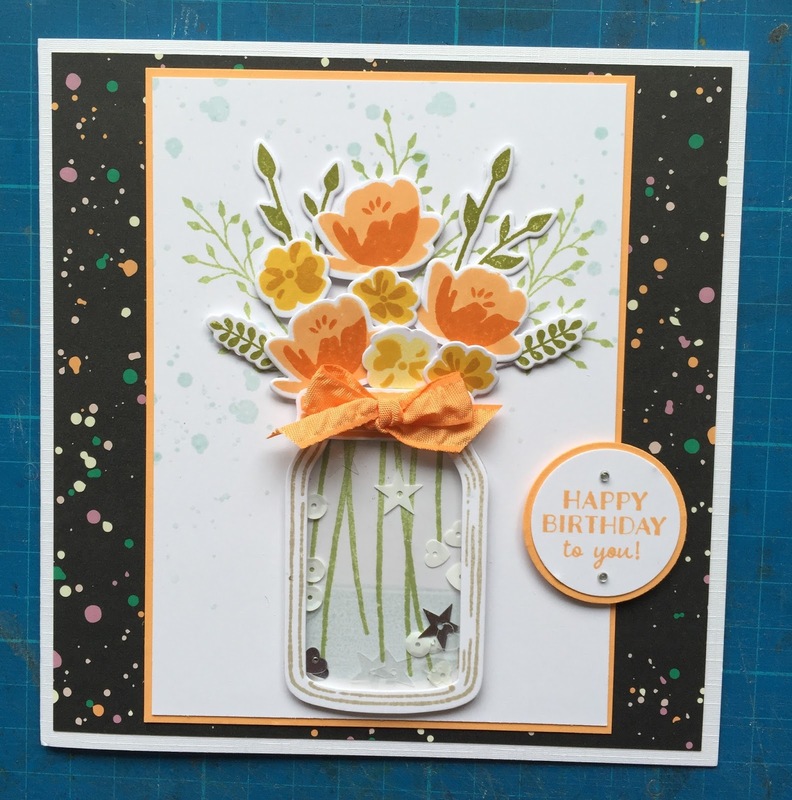 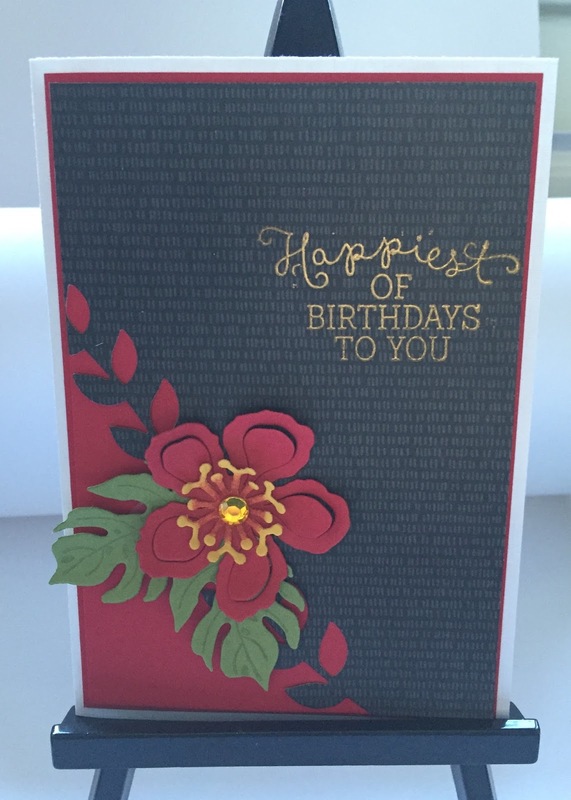 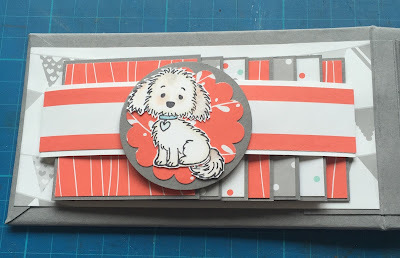 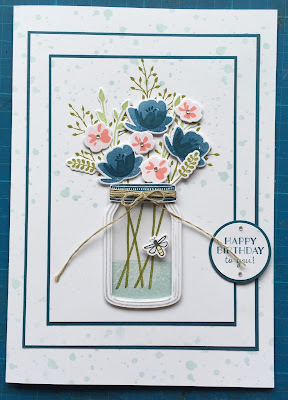 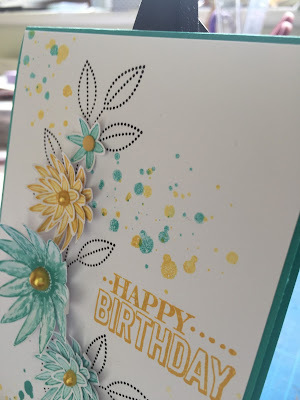 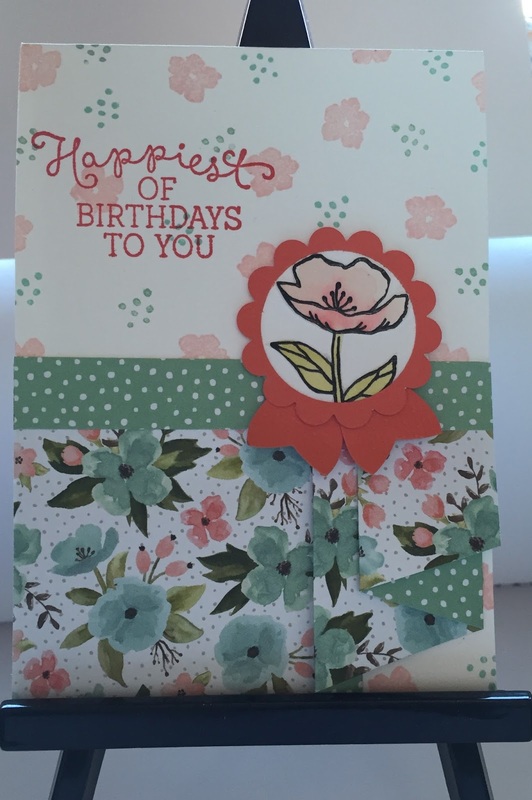 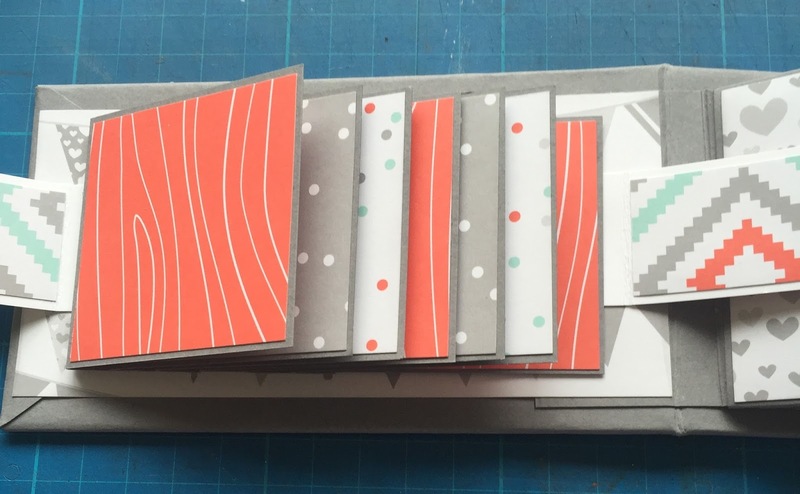 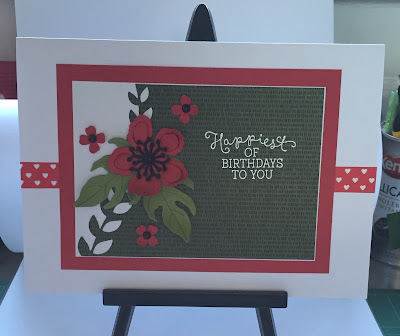 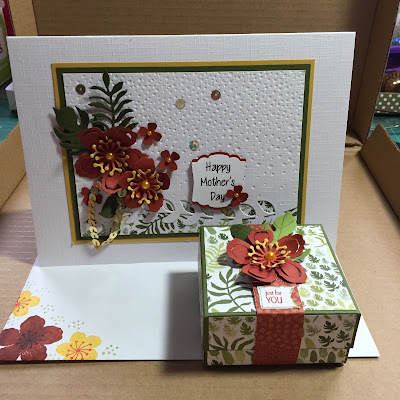 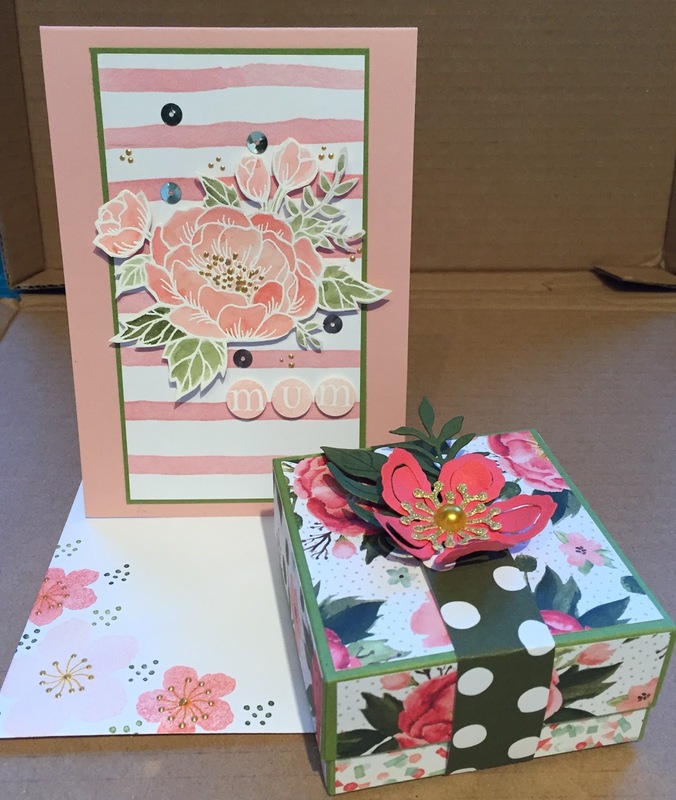 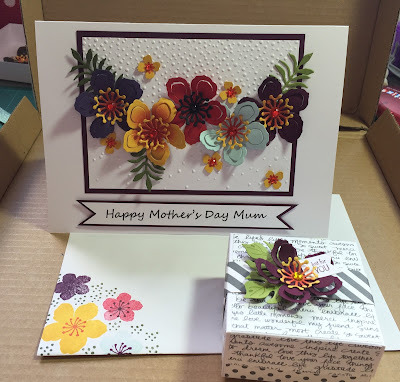 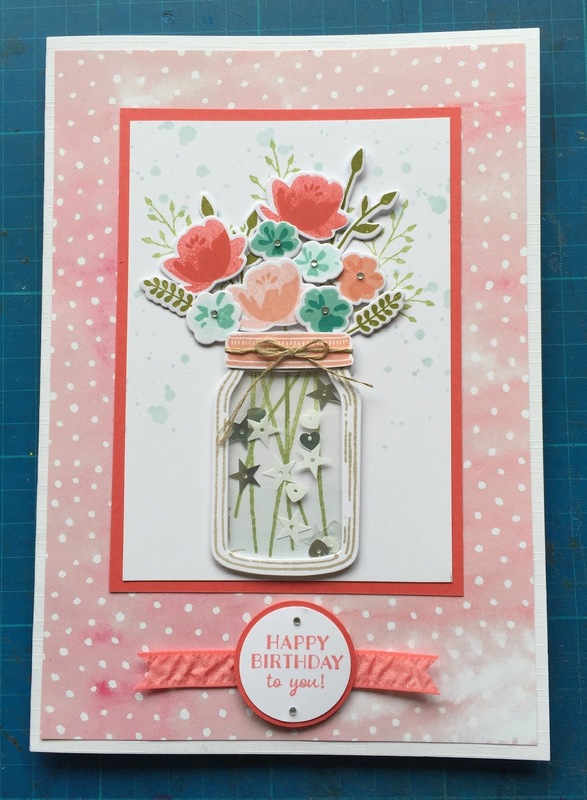 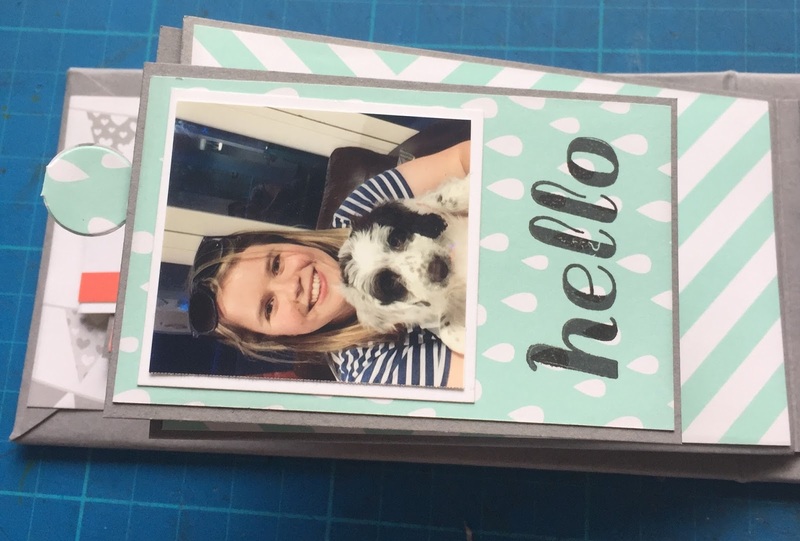 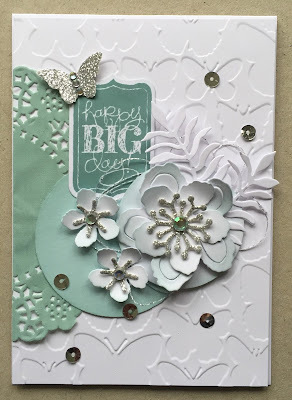 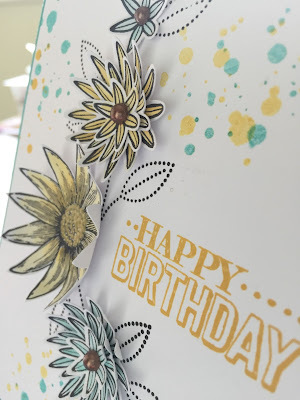 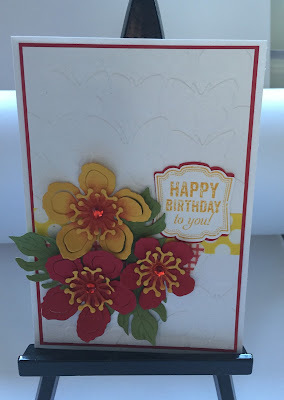 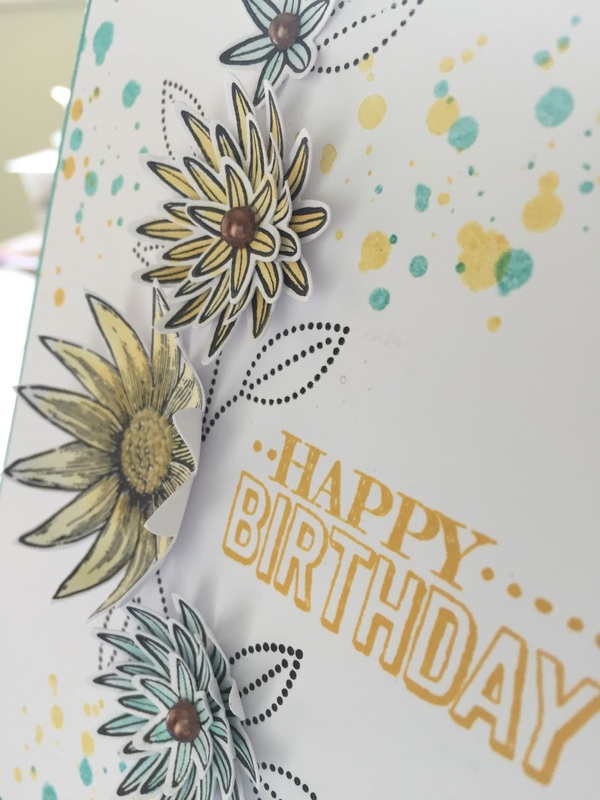 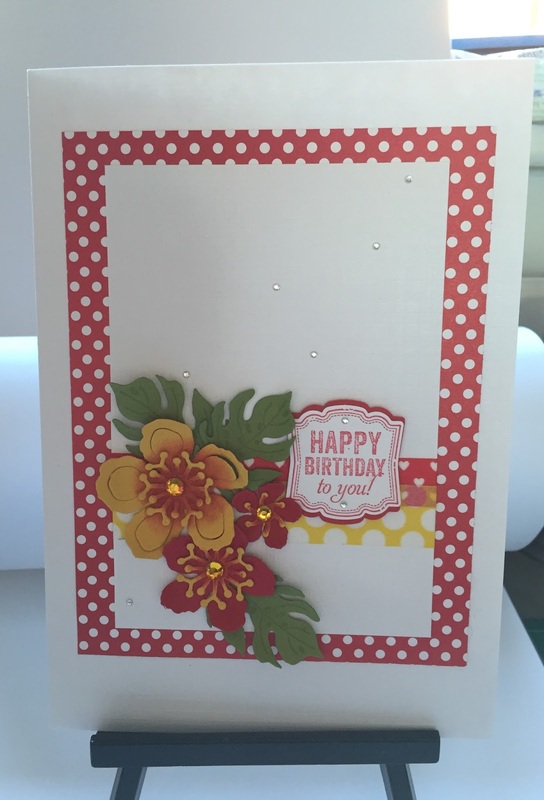 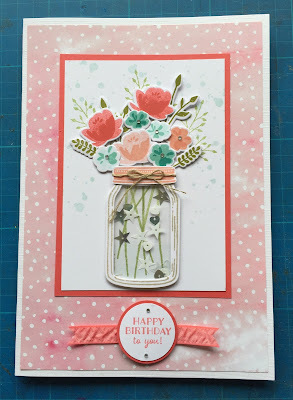 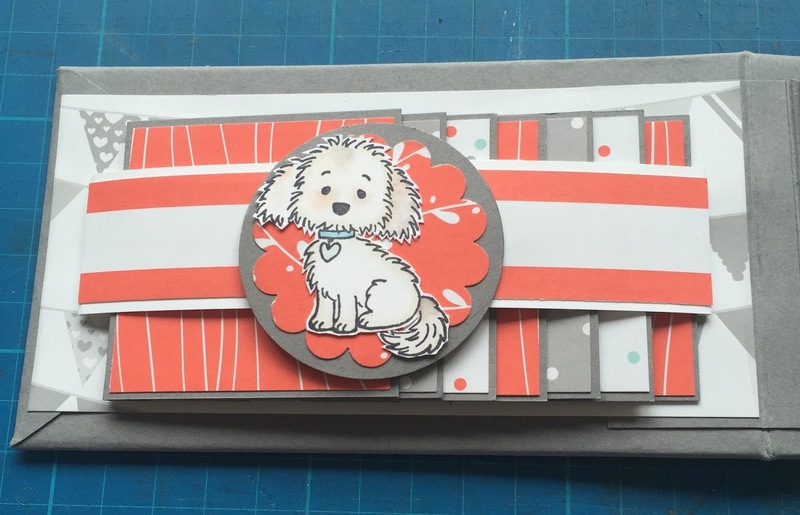 I'm in mini album mode at the moment and I have made several this week and I am going to show you one using this gorgeous dsp. 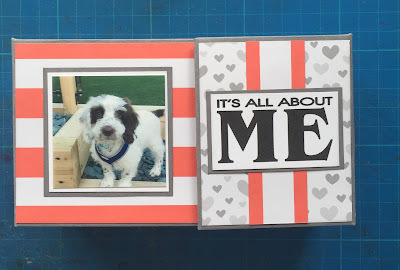 I've made the album for my daughter who has just got a puppy so I thought it might be nice for her to have some of her favourite photos of him printed out and popped in this cute book. This is the front cover and it has a magnetic closure. 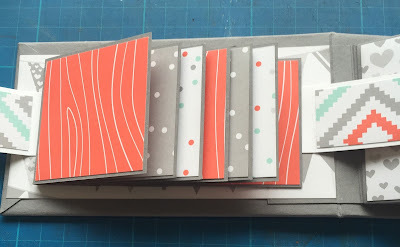 How it looks from the top. 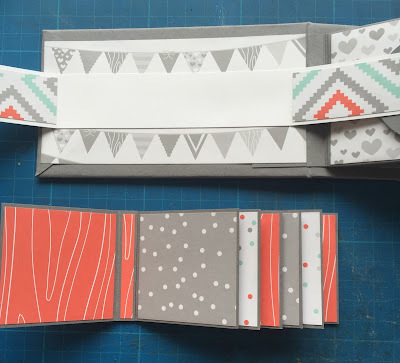 The inside front cover and if you open the belly band there is a waterfall booklet to add lots of photos. There are six pages in the book and they all have a tag in the end for adding more pics or journalling. I have made one little flap book and put some pictures of Toby in it to give Holly an idea of what to do. 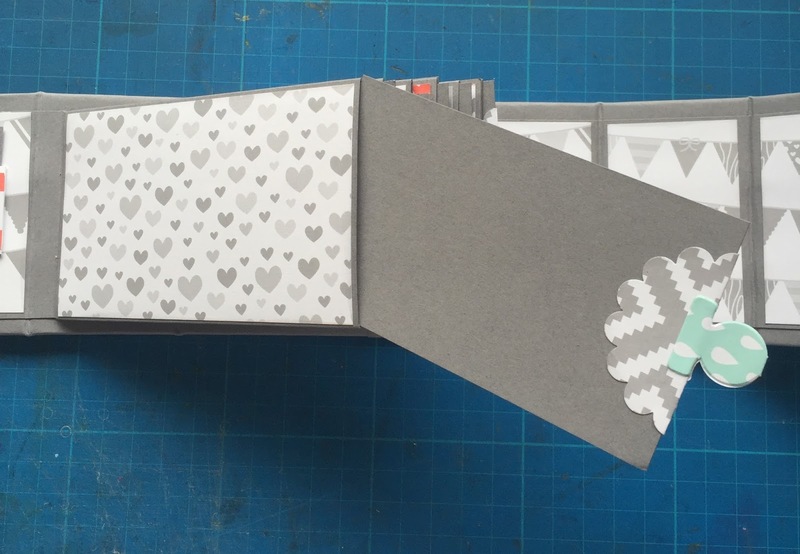 If she needs more of the flap booklets, I can soon make more. and again but opened out. 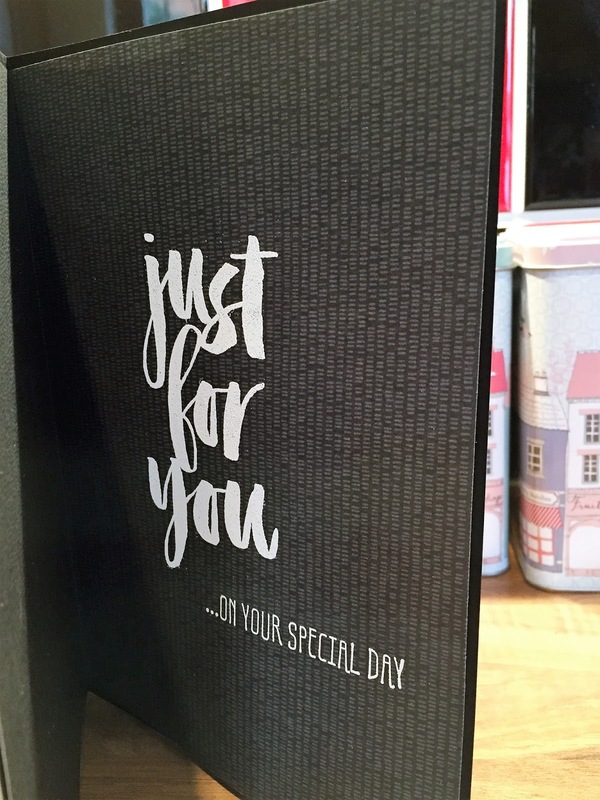 And that's it. I hope she likes it. Here are a few of the cards I've made with it so far. I've added some sequins behind the acetate to make this one in to a shaker card. This one is also a shaker card. 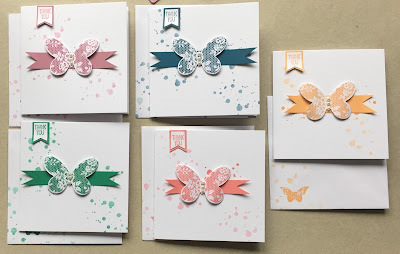 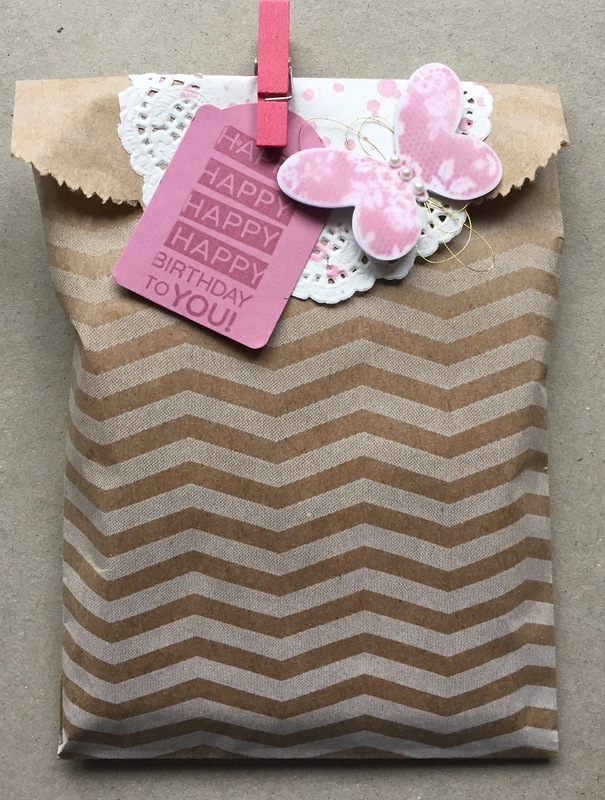 A few cards I've made recently using Stampin Up products. This is a card I made for a friend who's birthday it is today. 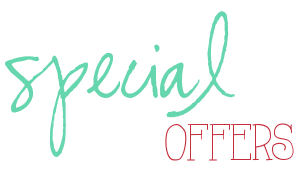 I also made her some thank you notelets. 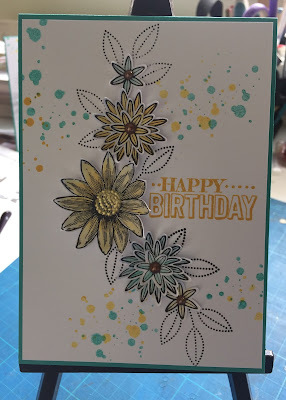 This next card I made for my friend Maria. 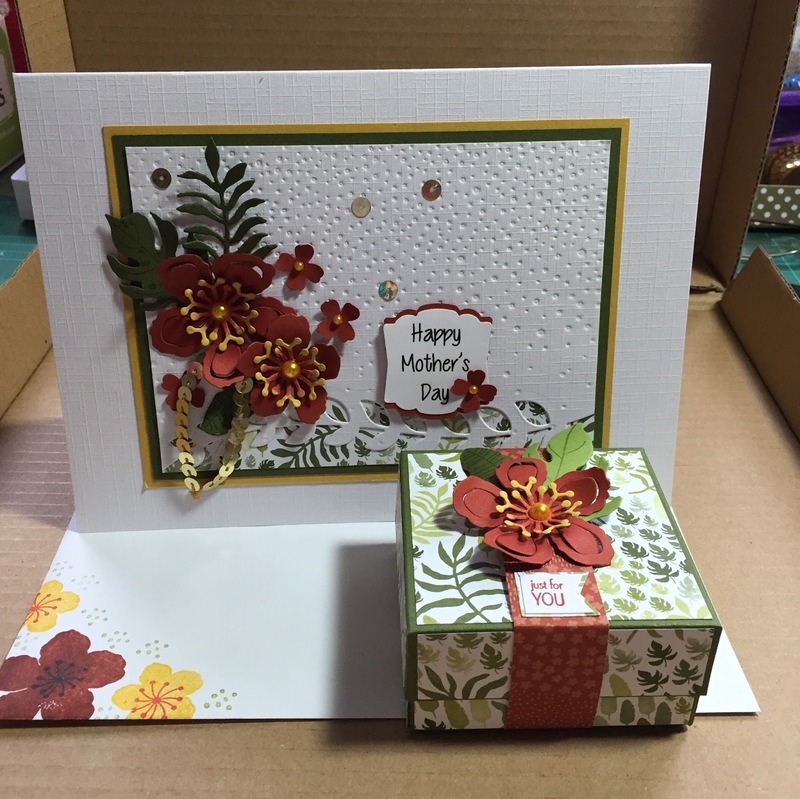 and this is similar one. This is another card I saw on Pinterest but I don't know whose it was as I see them and forget to pin them so they are made from memory. 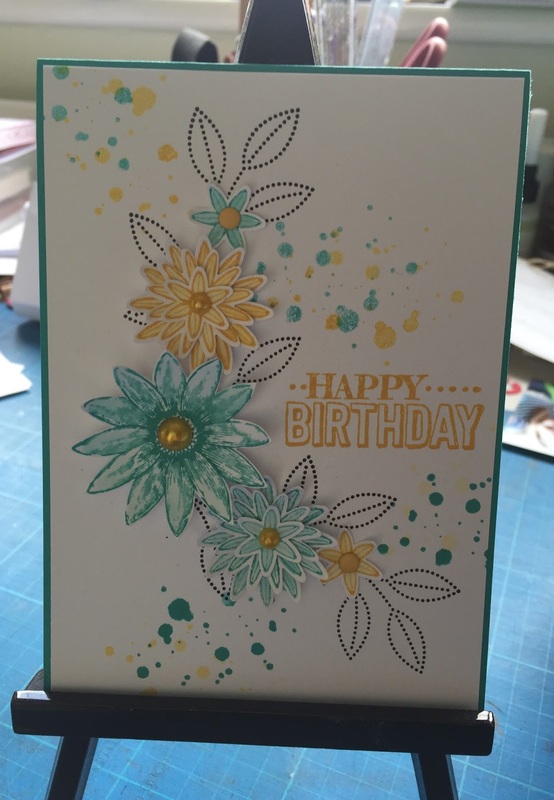 Another one, just coloured slightly differently. 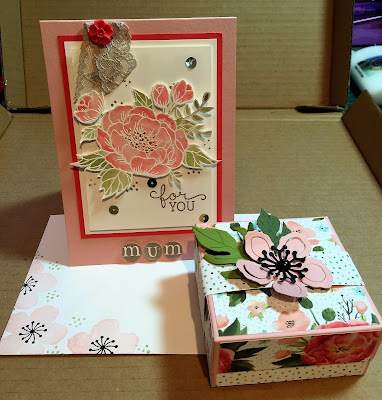 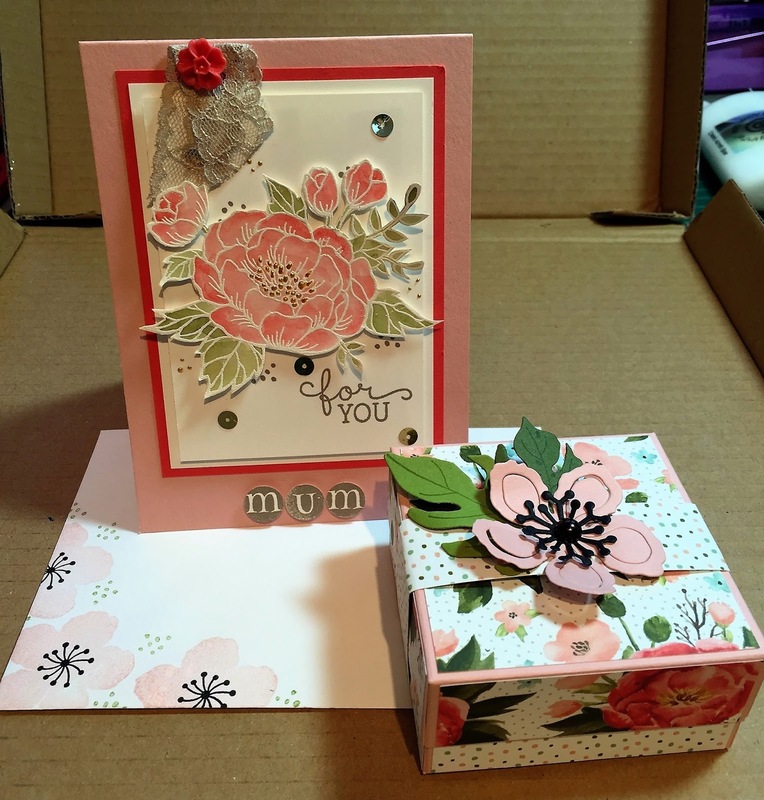 Just a few cards and boxes I've made for Mother's Day. 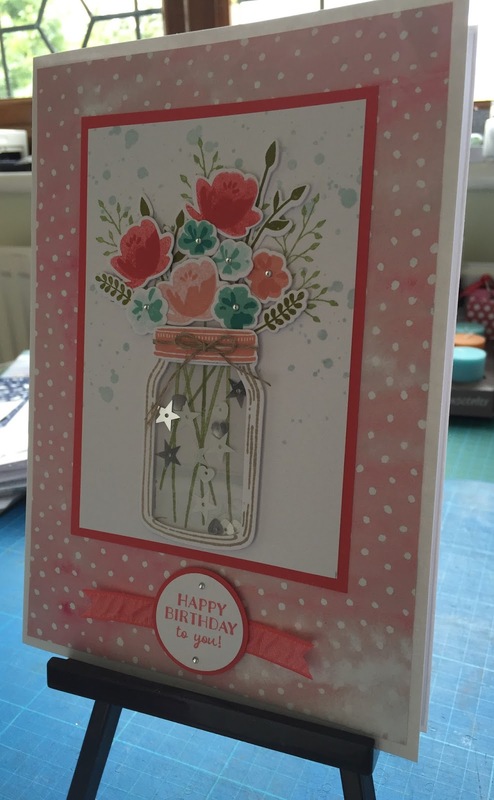 I have loads of birthdays in March so I've been busy making cards so I am well prepared. 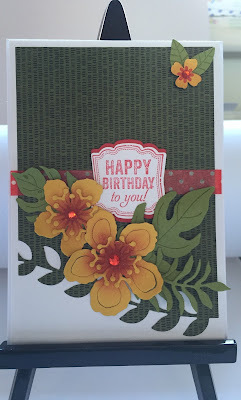 The first three I case'd from splitcoast stampers and I am quite pleased how they turned out. 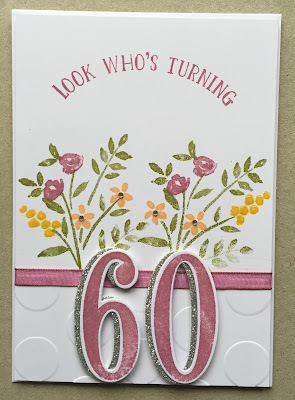 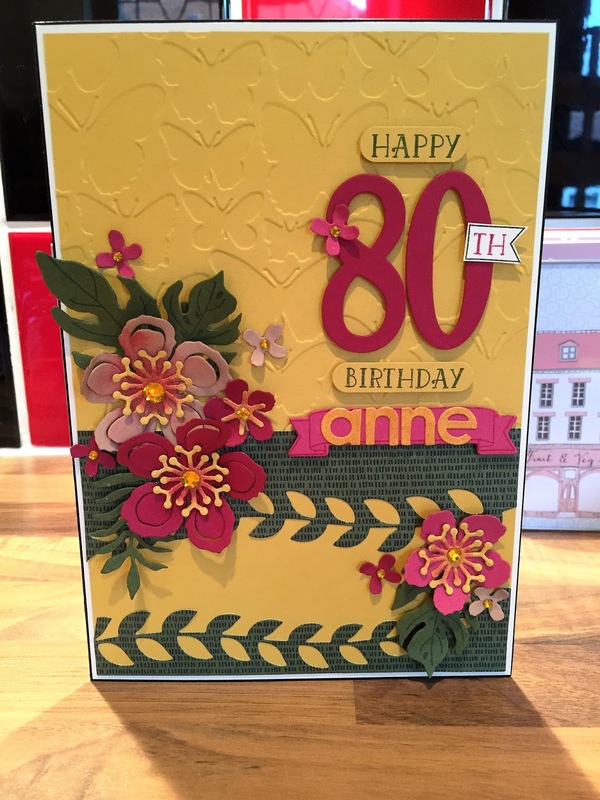 It's my neighbour's 80th birthday next week so I wanted to make her a special card. As I'm loving the new botanical blooms bundle I thought I'd go with them.